The names for two of these four ways came from research on shopping behaviour by Gary Davies in which he distinguished ‘cost’ convenience (choosing between similar standardised offerings) and ‘comparison’ behaviours (choosing between different solutions to the same demand). The other two separated out circumstances where there was a demand particular to the customer, distinguishing offerings in which there was only one place for the customer to go ( ‘destination’), or in which the supplier would adapt the offering to the customer’s requirement ( ‘custom’) within their context-of-use. The point being made, however, was that the ‘destination’ form of offering required asymmetric governance because of the need to hold power at the edge of the organisation. What distinguishes this position in the cycle? If we think of the original development of pc-based spreadsheet programs in-house (destination), they soon became a limited number of alternative branded solutions (comparison) that in turn became dominated by the one offering all the others’ features in one package (cost). From here we have seen an increasing ability to customise the ways it can be used (custom) to the point where we are now looking at a new cycle of web-based solutions that we can build one-by-one (destination). The result is a cycle showing the initial (problem-based) response as being a personal one to a particular demand in its particular context. A knowledge engineering process of codification can then transform this into a ‘product’, which can remain proprietary for as long as the codification can itself be protected (hoarded). Insofar as it cannot, it becomes public knowledge, so that competition is in terms of the cost of its provision. 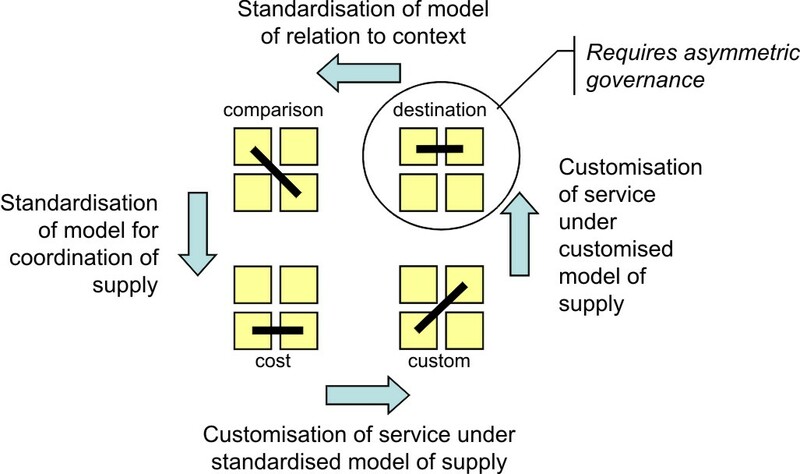 Finally, the process of embedding this public knowledge back into particular contexts through engineering use value takes us into the ‘custom’ quadrant. From here, the ‘jump’ is about starting a new cycle in relation to a new problem-based response. We see now how it is the personal nature of this problem-based response that distinguishes taking power to the edge of the organisation. It used to be sufficient to rely on the ‘free’ market to incubate such innovations. All business then had to do was to buy the idea, and manage the rest of the governance cycle. The point we make in our paper, however, is that this is becoming more difficult not only because the rest of the cycle is speeding up, but also because demand itself is becoming increasing asymmetric: everyone wanting something different. So in the 21st Century the whole cycle is having to be managed, with the balance between the stages in the cycle changing. This presents those leading at the edge with a double challenge, but it also presents those at the centre with the leadership challenge of developing a capacity for asymmetric governance. Two-sided platforms coexist and compete with other business models to fulfill customer needs. Market definition must consider the diverse ways in which a two-sided platform may face rivalry, taking into account the market participants’ reactions to price changes. These reactions are more difficult to predict when the firms are following different business models. First, a two-sided platform may face single-sided competition on one or both sides. For example, a shopping mall developer faces competition from single stores for the attention of shoppers, as well as from real-estate investors that rent single-store locations. The degree to which these single-sided alternatives constrain the two-sided mall’s conduct is an empirical question. this group of customers to lower the price—possibly to zero—of the key profit-generating side of the other platform. to compete with Microsoft in software. Competition from this advertising-supported software model has led Microsoft to enter into advertising to ensure that it also has a stream of advertising revenue available. The example here is of Google building targetable traffic by accelerating the diffusion and embedding of the (in this case) office productivity technologies, subsuming Microsoft’s pursuit of direct value by its own pursuit of indirect value. (For more on this distinction, see what distinguishes a platform strategy).